We help teachers to enhance creativity of children and to support the development of strong personalities. We offer our Good Start methodology for primary school teachers. 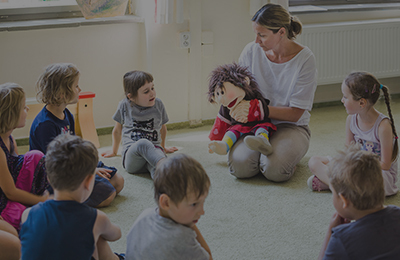 The methodology has been implemented in Czech pre-schools for over 10 years and has also proved to be beneficial for children in primary schools. We implement methodology “Good Start”, which focuses on the development of children’s social and emotional competencies. The methodology is designed for formal and informal pre-school institutions, and for primary schools. We provide support for teachers of primary schools in enhancing creativity and entrepreneurship skills of their pupils. We support the development of creativity, endurance and independent decision-making of children. Important aspects include building self-confidence and positive attitudes towards others. We respect the individuality of the child. We support active teachers of primary schools with attitudes that place initiative and responsibility in the children’s’ hands. We act as facilitators and couches. Thanks to the project focused on learning entrepreneurship at primary schools, we bring to Czech schools evidence based educational practices from abroad. A creative attitude in dealing with problems, perseverance in achieving the goals, and ability to communicate one’s own thoughts. We provide primary & secondary schools teachers with support in developing creativity and entrepreneurship skills of pupils. The project is focused on the ability to see opportunities in one’s own surroundings, to use one’s own skills and capacities to transform these opportunities into personal targets in creative and innovative ways. We prepared four sets of supporting methodological materials for teachers enrolled in the project “Learning Entrepreneurship.” These include: “Our Enterprise”, “Profiles of Entrepreneurs”, “Communication and Dealing with People and “Harry Potter: The Explorer”. The cohesion of different levels is an important aspect for the quality of education. Therefore, we aim to support the interconnectedness of pre-schools and primary schools through further education of teachers. We also focus on enhancing cooperation between parents and school enhancing the role of the school in the socialization process of children from disadvantaged environments. Sharing good practices and materials for daily classwork. Support for processing teachers owns methodological materials. We are creating a platform of 42 centers of collegial support in primary and secondary schools to enhance the entrepreneurship skills of pupils. We provide internships for primary school teachers in educational institutions across the Czech Republic and the EU.